Co-production, or service delivery in partnership between citizens and the public sector, has come a long way in the decades since it was first conceptualized. In urban areas, co-production is being applied to water and sanitation provision, to post-disaster rebuilding, and to housing upgrading, among other uses. This issue of Environment and Urbanization explores the range of urban co-production in the global South. Three papers profile urban poor groups in Namibia, Kenya and Thailand, explaining their history of working with and through government. Other papers focus on tools of co-production, applied in specific circumstances: memoranda of understanding in Zimbabwe, community mapping in the Philippines, and a network of knowledge production spanning multiple continents. Still others reflect on the nature of co-production, and how it relates to the strategies of urban social movements and the concept of intersectionality. Together, these papers show that co-production is about the daily work of service provision, but also about the larger work of cultivating relationships and empowering communities. The cases provide ample evidence of low-income urban communities taking the lead. Also in this issue of Environment and Urbanization are papers on: urban flood resilience in Dhaka; sanitation services in smaller urban areas of Malawi; water protests in Tanzania; and urban waste management in Maputo. This issue of Environment and Urbanization explores the growing field of humanitarian activity in urban areas of the global South. The papers showcase current and emerging thinking around urban humanitarian methods, from working in consortia (as in Eastern India) to area-based approaches. While certain methods are proving more effective and participatory than old models, some aspects of urban post-disaster aid lack easy solutions. For instance, humanitarian organizations in urban Haiti face the difficult question of whether they should work with armed gangs, and risk losing moral credibility, or sidestep armed groups, and risk losing access to areas of need. Overall, the issue underlines the importance of working with community organizations and locally embedded groups. This is particularly important when aid is absent in post-conflict situations (as in Somaliland), or when the urgency of a disaster means that volunteers emerge spontaneously in the first hours and days following the event. However, the papers also show that the situations requiring humanitarian response are not limited to the immediate aftermath of an earthquake or flood. There are large challenges in the longer-term effort of rebuilding communities, reducing conflict, strengthening livelihoods for affected people (such as different groups of migrants to Kampala), and enhancing post-disaster governance (such as in Nepal following the 2010 earthquake). Yet these areas also provide powerful opportunities to build back better, and not just in a physical sense. This issue of Environment and Urbanization is on the full spectrum of risk in urban areas of the global South and their contribution to premature death, serious injury, illness or impoverishment. The papers show the large spectrum of risks from infectious and parasitic diseases, pollution and physical hazards. “Small” disasters and every-day hazards that often receive less attention than disasters actually pose greater risks, especially among low-income groups and those living in informal settlements. City-specific studies in this issue explore the nature and measurement of local risks, in Karonga, Malawi; Niamey, Niger; Bandung, Indonesia; Bangkok, Thailand; and Nairobi, Kenya. The issue also includes papers that interrogate the concept of risk resilience, calling for greater attention to rights, justice, and concrete community-led action. The papers propose new directions for classifying and collecting information on risks, which is the first step towards reducing risks for the most vulnerable urban residents. Several of these papers emerged from Urban Africa: Risk Knowledge (Urban ARK), a research and capacity-building programme seeking to reduce risk in urban areas of sub-Saharan Africa. This issue's papers on climate change in cities tackle different aspects of the urban sustainability challenge: the urban heat island; climate change, equity and the Sustainable Development Goals; and pro-poor, low-carbon urban development (looking specifically at Kolkata). In Feedback, two papers examine livelihood issues: one is on the livelihood impacts of the Arab Spring; the other is on a janitorial job programme in Cape Town that sought to combine livelihoods with toilet maintenance. Other papers propose frameworks for understanding current urban conditions: household energy needs in Thai cities, and micro-inequalities more generally. And several papers look to the future. One outlines what is needed for genuine gender transformation in a global urban agenda, while another explores the potential of self-financing urban development to reduce inequality and increase local involvement in urban policy. Two papers provide alternative predictions of which cities are likely to be the largest in the next century. The network Women in Informal Employment: Globalizing and Organizing (WIEGO) guest edited this issue, drawing on its experience of working since 1997 to improve the situation of the working poor in the informal economy. The themed papers in this issue therefore focus on informal employment in particular sectors and contexts, providing both comprehensive surveys of the related literature and grounded accounts of the working lives of specific groups. The occupational groups span street vendors, waste pickers, fisherwomen, and home-based workers. Geographically, the papers examine India (Ahmedabad and Udupi), South Africa (Durban), Tanzania (Arusha) and Peru (Lima). And in terms of theme, the papers explore the ways gender, youth, class and caste intersect with employment that is often precarious or under-valued, as well as the resourceful solutions that the urban informal workforce is drawing upon to improve health, safety, and earnings. All this leads to concrete policy suggestions for ways to strengthen urban livelihoods. A strong gendered component runs through the papers on urban livelihoods, as WIEGO particularly works to mobilize female workers. The papers on climate change in cities address adaptation at two different levels: collaborative production of a municipal climate adaptation plan in Bergrivier, South Africa; and the adaptation of wetland communities in Kampala, Uganda to flood risk and other vulnerabilities. In the Feedback section, the three papers on India analyse the successes and failures of initiatives in three informal settlements: grassroots efforts to upgrade housing in Mumbai, basic service provision to migrants in Ludhiana, and canal reclamation that threatened to displace canal-side residents of Kolkata. The two papers on China both make use of political and historical analysis, to understand urbanization policy before and after the Millennium Development Goals, and the factors behind China’s urban sprawl in the past 20 years. The remaining papers address the take-up of basic services in low-income areas: a new type of toilet in Kumasi, Ghana; and efficient lighting technologies in the Kibera settlement of Nairobi. The papers on climate change in cities examine how vulnerability and adaptation are shaped by particular spatial contexts, community practices and political decisions in Dakar, Brazilian municipalities and Rio Branco. Papers in Feedback describe the varied responses to inadequate services and infrastructure in urban areas, with a particular focus on informal settlements. These encompass young entrepreneurs providing critical sanitation services in Kisumu, urban poor federations building housing in Mumbai, and wetland communities adapting to flood risk in Kampala. Other papers examine the effectiveness of communal toilets in Kisumu, the decline of rental housing in Mumbai, and how the Ahmedabad government’s infrastructure projects not only displaced large numbers of low-income groups, but also passed on costs as well as maintenance and management responsibilities to those in the resettlement sites. In light of the failure to reach the sanitation target of the Millennium Development Goals (MDGs), this issue of Environment and Urbanization explores methodological, political, financial and other challenges to measuring and improving sanitation in urban areas. This is the second 2015 issue of Environment and Urbanization to cover sanitation and drainage. Only one of the countries covered in these two issues met its MDG target. Some even saw their urban populations’ access to improved sanitation decline from the start of the reporting period in 1990. These papers are therefore very timely given the global discussion around how to ensure the stronger performance of the Sustainable Development Goals (SDGs). However, as the editorial points out, it will be essential to establish a robust monitoring system to actually implement the SDGs. The themed papers in this issue cover Maputo (Mozambique), Johannesburg (South Africa), Mumbai and Chandigarh (India), Ulaanbaatar (Mongolia), Dar es Salaam (Tanzania), Lusaka (Zambia), Cap Haitien (Haiti), Shanghai (China) and Accra (Ghana). Topics covered include the realities and limitations of market-driven sanitation services; the interplay of politics and history in determining the context of urban sanitation; the role of tenure in sanitation decisions; and innovations in the management of waste. Several papers address the prevalence of communal sanitation in poor urban environments, despite shared sanitation not falling under the definition of “improved” sanitation. The papers also highlight that progress in extending sanitation access has been highly uneven. The papers on climate change provide examples of positive steps toward resilience. These cover Uganda (where residents of informal settlements are engaging in participatory resilience building) and Indonesia (where two cases of adaptation in riverbank settlements are compared). The feedback section features a paper documenting how urban poor leaders have set their own national poverty lines. Other papers explore climate and health in informal urban settlements and uneven disaster risk in Tigre, Buenos Aires. EDITORIAL: Will urban sanitation “leave no one behind”? The urban sanitation conundrum: what can community-managed programmes in India unravel? In much of Africa and Asia, provision for sanitation and drainage in urban areas has improved little. In many, it has got worse as today, a higher proportion of residents lack provision than in 1990 or 2000. This issue of Environment and Urbanization has many papers showing new approaches. They include innovations in Blantyre (Malawi), Chinhoyi (Zimbabwe), Dar es Salaam (Tanzania) and Kitwe (Zambia) on matching needs with what can be afforded and working with local government. A paper on Chinhoyi reports on community-led mapping and enumeration of sanitation to inform a city-wide sanitation strategy while a paper on Mumbai (India) shows the scale and reach of community toilets and a paper on Cap Haitien (Haiti) reviews the experience with container-based toilets. There are also papers on: how poorly the sanitation needs of adolescent girls are met; violence, gender and water and sanitation; and scoring cities in India for sanitation and cities in China for health and hygiene. Three papers look at building urban resilience to climate change: in Warri (Nigeria); Bandar Lampung (Indonesia); and the University of Ibadan (Nigeria). A fourth paper on resilience discusses its use in wider sustainability challenges. There are also papers on: the impact of participatory budgeting in 20 cities; displacement in Ahmedabad; land contestation in Karachi; rural-urban interlinkages in China; sustainability and neoliberal urban restructuring; and post-disaster reconstruction in Llico, Chile. This discusses the dramatic increase in conflict in urban areas and a paradigm shift in the approach to managing violence. Violence in cities across Africa, Asia and Latin America can no longer be seen as a problem which can be overcome through development programmes. It also provides new insights which could help those affected to manage violence on a day-to-day basis, as well as empower them to question and address the causes. It includes papers on: urban violence and displacement of Colombian migrants to London; partnerships for women’s safety in the city; gangs in global perspective; violence in post-invasion Kabul and in post-war Juba; exploring insecurity, violence and resilience in the fragile city; the “humanitarianization” of urban violence; visible and invisible violence in Santiago; and knowledge transfer on urban violence: from Brazil to Haiti. After an editorial on how to get local governments, residents and enterprises to respond to the new IPCC Fifth Assessment, four papers discuss different aspects of resilience. These include how the IPCC understands transformative adaptation; how resilience must be coupled with transformation; what cities are doing to build resilience to disasters; and building resilience in an informal settlement. Six papers show the full spectrum of responses to climate change, while another paper reviews urban residents’ coping and adaptive practices. There are also papers on the highly inappropriate city plans being developed in sub-Saharan Africa and India; on urban poverty in Zambia; participatory budgeting in Chengdu, China; community upgrading in Manila; and participatory methods for researching entrepreneurship. This focuses on what builds resilience to climate change in cities – and beyond this, what contributes to mitigation and the avoidance of dangerous climate change. It includes case studies of climate change adaptation in Durban, Dar es Salaam and Rosario (Argentina), and others that address flood risks in Surat (India) and Bursa (Turkey). It also has papers that discuss shared learning for resilience thinking across 10 cities in Asia; the political underpinnings of resilience; methods for integrated assessments of climate impacts, adaptation and mitigation as applied to London and Durban; and governing urban climate change adaptation in China. The Feedback section includes papers on urbanization and economic growth; professional support to people’s organizations; formalizing informal recycling in Buenos Aires; watercourse sanitation in cities in Taiwan; incorporating agriculture into the Dar es Salaam master plan; and the costs of being “Olympic citizens” in Beijing. Urbanization is often associated with greater independence and opportunity for women – but also with high risks of violence and constraints on employment, mobility and leadership that reflect deep gender-based inequalities. These issues are explored in the April 2013 issue of Environment and Urbanization, which is on Gender and Urban Change. It includes papers on: where and when urban women enjoy advantages over their rural counterparts; community savings schemes that build women’s leadership and support upgrading; how transport planning still fails to respond to women’s travel needs; how urban contexts can reduce gender-based violence, although often they can increase it; how income and ideology influence women’s decision-making in rural and urban areas in Nicaragua; the changes in women’s participation in labour markets in Dhaka and the tensions this can generate within households; what was learnt from a project working with girls and boys with disabilities in Mumbai; and the particular roles of women in seeking to get better services for their low-income/informal neighbourhoods in Bengalaru. This issue has seven papers that consider the design and implementation of an ambitious Asia-wide initiative to support community-driven citywide upgrading − the Asian Coalition for Community Action (ACCA). Starting in 2009, this programme has supported 950 grassroots initiatives in 165 cities in 19 Asian nations and has set up Urban Poor Funds in more than 100 cities to help continue such support. These initiatives were also to encourage and support communities to learn from each other and to work together to get the engagement and support of city governments for citywide upgrading. The papers consider different aspects of ACCA, including how it evolved and how it uses finance to support community action and engagement with local governments (and the setting up of national and city Urban Poor Funds). Also, how it supports collective processes within low-income communities, including: collective information collection (settlement mapping, citywide surveys); collective definition of problems and search for shared solutions; and bringing together savings networks. One paper presents the perspectives of two community leaders from the Philippines on change-making by communities, and who helps or hinders them; another explains how the community initiatives are being assessed by peers (those engaged in comparable community initiatives) rather than outside ”experts” who have no experience of living in informal settlements on very low incomes; and another discusses the role of community architects and other professionals working in grassroots-directed initiatives. Five papers are on climate change and cities: lessons from practice in Asia for building climate change resilience; addressing climate change in New York City; incorporating cities into the post-2012 climate change agreements; Ibadan’s vulnerability to wind hazards; and assessing climate change adaptation for water and sanitation providers. Papers in Feedback include: why enumeration counts; the health and social implications of living in a non-notified slum in India; financing urban agriculture; and mapping and enumerating informal Roma settlements in Serbia. The April 2012 issue is on Mapping, enumerating and surveying informal settlements and cities. It includes case studies from Ghana, Kenya, India, Namibia, South Africa, Tanzania and Uganda of how the residents of informal settlements worked with grassroots leaders and local NGOs to map and survey their settlement. These discuss how this helped to develop better relations with local government and in some cases partnerships. 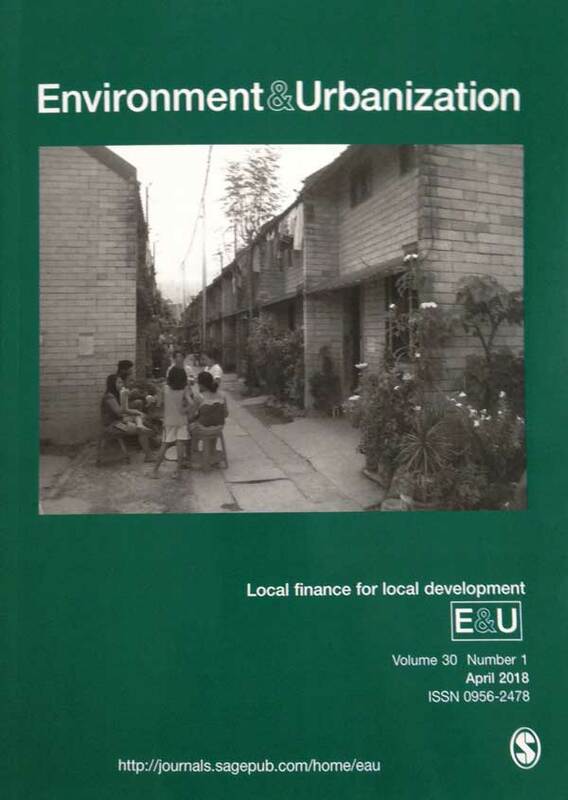 Also included is an account of how community-based enumerations started in India, a discussion of the role of architects in community mapping and planning, and a paper reviewing the environmental effects of informal urban expansion in Xalapa. On climate change adaptation, there are papers on exploring ecosystem-based climate change adaptation in Durban, assessing flood protection measures in Dhaka and drawing in private finance to develop resilient cities. It also has papers on revisiting a rehabilitation programme, 10 years after the earthquake in Gujarat, the fragmentation of urban landscapes worldwide, socioeconomic characteristics of informal dwellers in South Africa , assessing the performance of constructed wetlands in Thailand, the transformation of “villages in the city” in Guangzhou (China) and migration and mobility in a rapidly changing small town in Ethiopia.